The 52mm 99-UVBT UV Filter is Chiaro’s top-performing protective UV filter offering 99% light transmission. It’s ideal for photographers who demand the highest-quality glass and other essential features for uncompromised image fidelity and premium construction. To achieve superior 99% light transmission, Chiaro uses highly-polished Schott glass, multi-coating, and additional advanced elements that improve the filter’s light transmission. A scratch-resistant coating minimizes scratching of the glass and helps assure that water, oil, dust, and fingerprints are removed with a gentle wipe. The durable brass filter ring is designed to screw on and off effortlessly, and it’s thin to prevent vignetting when used with wide-angle lenses. Multi-coating enhances light transmission to the demanding level we set for all Chiaro filters. It reduces unwanted internal reflections and ghosting that can compromise your images. Top knurling offers a firm grip on the filter when you're attaching or removing it. Box Dimensions (LxWxH) 4.0 x 3.3 x 1.0"
52mm 99-UVBT UV Filter is rated 4.9 out of 5 by 16. Rated 5 out of 5 by Anonymous from Protect your glass with Chiaro Everyone should have a UV on all their lenses - just for the simple reason of protecting your expensive lens against dirt, dust, and smudging. Chiaro offers the ultimate in protection without the loss of image quality. The 99-UVBT uses the same Schott glass, multi-coatings, and resistance coatings as the top of the line 99-UVBTS - the only difference is in the knurling. BT is knurled just at the top while the BTS is knurled on the top and sides. I do prefer the BTS for the best grip but if you want to save a little cash ($8 for the 62mm) then the BT will most likely serve you well into the future! Rated 5 out of 5 by Anonymous from Quality filter in harsh conditions I photograph in a variety of conditions, and some of those places can be rough on my gear. Blowing sand and dust, saltwater spray, and rain can make for great images but protecting my lenses from the elements is critical. The Chiaro UVBT UV filter does that job well. It is easy to clean and doesnt bind up on the lens when attaching or removing it. Most of all though, this filter provides reliable protection for my leness without compromising the quality of the resulting images. 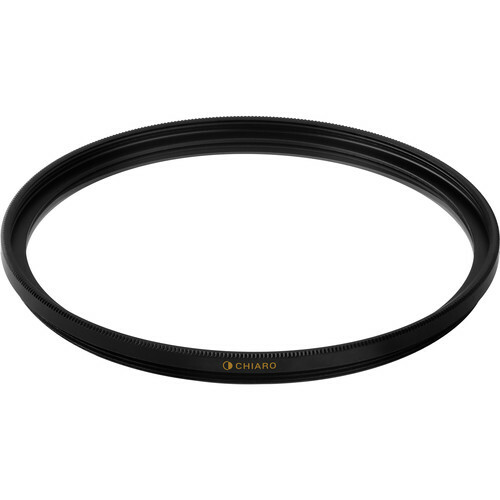 I would recommend this filter to anyone who is looking to protect their high-end lenses. Rated 5 out of 5 by Anonymous from Keep it clean with Chiaro I love the Chiaro range of filters. They offer premium products at a variety of budget ranges. This is their 2nd best filter but really the only difference between their top of the line 99-UVBTS and the 99-UVBT is the knurling which is only on the top of the filter whereas the BTS has it on the sides and top. You can save yourself $5-$10 with this top only and still get the excellent image quality, coatings, and brass ring. If you aren't stacking a multiple filters this is a great way to save a little cash. Rated 5 out of 5 by Anonymous from Great Filter! Bang for your buck, this is one of the best UV filters on the market. 99% light transmission, polished Schott B270 glass and brass construction that prevents the filter from binding on the lens. The only difference between this filter and the UVBTS is the knurling - or grip - is on the top only, versus the top and the sides. In my opinion, if you are willing to spend an extra $10, it is nice to have the grip on the sides with the UVBTS style - but the UVBT gets five stars for optical quality, build quality and price. Rated 5 out of 5 by Anonymous from Low-profile, Lots of Light Transmission I use a UV filter as a protective filter on all of my lenses because it may take the brunt of a drop or bump, but also because it keeps salt water spray, dust, and sand off of the front element of my lens. But I won't just put any UV filter on my lenses, they need to be clear, without color cast or distortion, and cause no vingetting. This filter fits the bill perfectly. Rated 5 out of 5 by Anonymous from BT vs BTS I'm really digging the Chiaro filter line and I have been investing in their top of the lint 99-UVBTS but I wanted to see what the difference between the BTS and BT were all about. Same brass filter ring, same Schott glass, same 99% light transmission...the difference is in the knurling. To be honest, I haven't experienced knurling with filters before and I absolutely love the top and side knurling on the BTS - incredibly easy to grip at an angle to take on/off. The top knurling on this filter is like teeth on the top of the brass ring. This seems to be better suited for stacking another lens on and making sure it won't stick. You can still use the top knurling to get a grip on the filter to remove or put on - but after testing I prefer the top and side knurling the best. Price difference between the BTS vs BT is $5 so why not get the absolute best? Rated 5 out of 5 by Bart from Chiaro UV Filter Most of my filters are B+W because I dont want my lens quality compromised. I needed a new 67mm UV filter and saw the Chiaro. Had not heard of this brand, so I checked out their web site - its very informative, and I would recommend having a look. It certainly appears to be a very good filter. I have noticed no image degradation, and I do comparison shots. I would certainly buy Chiaro again if I need another UV filter.